The regular München - Zürich EuroCity trains are booked for pairs of Mühldorf class 218s, which work out from München to Lindau then return on the next EC. It wasn't obvious how the additional locos for the Fridays only EC1291 were going to get to Lindau to work the train to München. In the event the train ran with locos based at Ulm, not Mühldorf. 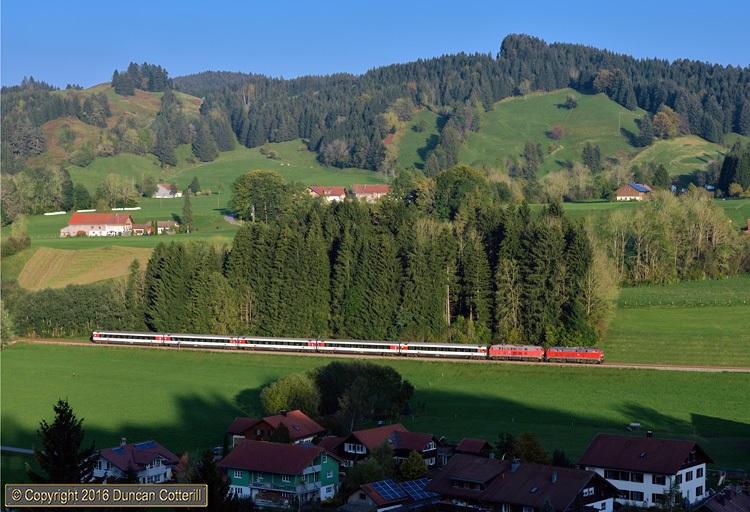 218.494 and 218.343 passed Oberthalhofen with EC1291, the 15:16 from Zürich HB to München Hbf, on 3 October 2014.